“On Thursday last, Mr. M.C. Motch, the well known Madison street jeweler moved into his store, which is in the north half of the new storefront building just erected by him, at the northwest corner of Pike and Madison Streets. 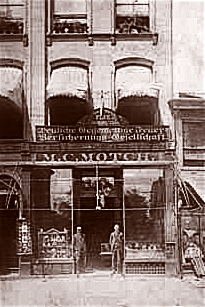 In the opening of this new and elegant establishment, Mr. Motch has taken the initiative in a movement to bring to perfection a branch of trade in which our city may be said to have been heretofore deficient, and has exhibited a spirit of enterprise that demands, the admiration and appreciation of the public. Front view of Motch Jewelers; store designed in 1871 by architect James W. McLaughlin. The front of the store room is formed principally by two immense glass windows surrounded by silver plated frames. The floor is formed of alternative blocks of white and black marble. On the right, two marble top counters run the entire length of the room on which rest silver mounted show cases, containing watches and jewelry of every kind, of exquisite workmanship, and a dazzling display of rare and costly gems. 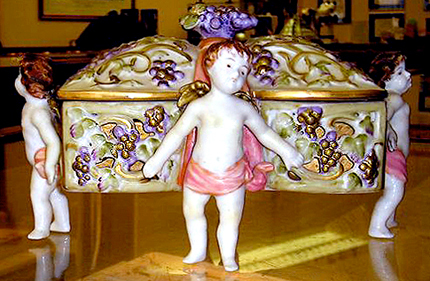 In the rear of the counters are three large walnut cases, of beautiful design and elaborate finish, in which are displayed a splendid array of solid silver and plated ware, from the best manufacturers in the country. 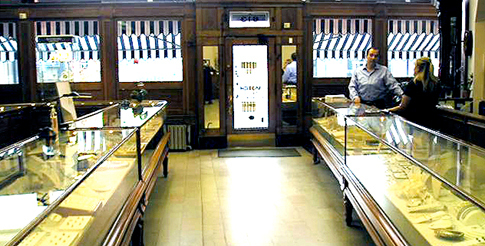 Interior of Motch Jewelers with all original walnut cases from 1871. This article in the Covington Journal, dated September 23, 1871, referred to Covington, Kentucky’s Motch Jewelers, one of the oldest family owned jewelry stores in the Midwest to this day. Being an avid fan of the Victorian era, I myself recently purchased an 1871 brick Italianate in Covington, KY. 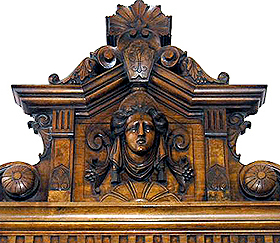 I launched my Victorian business, called Opulent Annie’s, specializing in the design and production of Victorian and Art Nouveau architectural ornaments. I came across Motch Jewelers when 1360thesource.com gave me the opportunity to host my own radio show focusing on the Victorian era. My show was to feature weekly guests with related Victorian businesses and topics. 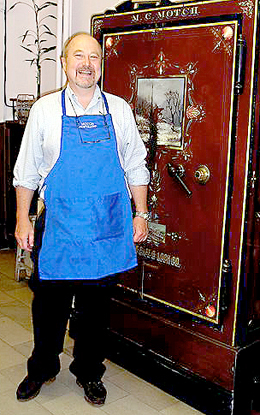 I had driven by the spectacular landmark Boston E. Howard and Co. cast iron street clock of 100 plus years on the sidewalk in front of Motch Jewelers, and so decided to make a visit to the shop. I discovered that, in 2006, two local artists performed a restoration on the street clock’s face and pedestal. In addition, I learned that the Motch family has maintained the original key, which is still used to wind the clock every week. What impressed me the most, aside from the gorgeous original Victorian interior of Motch Jewelers, was the genuine friendly customer service that the employees exuded. Busy at work, Manager Tim Dwight stopped to introduce himself and show me the incredible ten foot George Jones Regulator clock. While talking with me, he explained the history of the store with great enthusiasm. 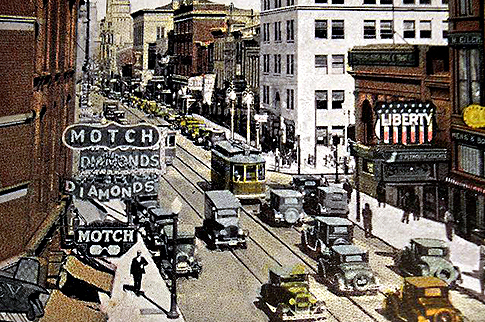 Motch Jewelers earliest original photo. Michael Motch came to the United States from France in 1857 and settled in the town of Covington, Kentucky; which, at the time, had a population of 10,000 people. 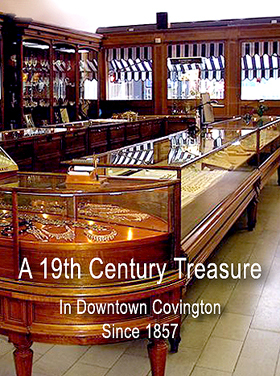 In Covington, there were 80 other jewelry stores, 49 businesses, and ninety stores. In 1871, after he became successful, Motch hired Cincinnati architect James W. McLauglin to design a new building for the store located at 613 Madison Avenue, the very location that the store resides today. McLaughlin was a popular 19th century American architect whose distinctive revival of Romanesque architecture became well-liked, especially in public buildings such as the Cincinnati Art Museum and the Art Academy of Cincinnati. The Art Academy was home to the artists of Cincinnati’s golden age, including Frank Duveneck, Henry Farny, Dixie Selden, and, the founder of Rookwood Pottery, Maria Longworth Nichols. Old hand colored postcard looking north on Madison Ave, circa 1920s. Interestingly enough, after speaking further to Tim Dwight, I learned that he had attended the Cincinnati Art Academy. Tim studied geology and art at the college, and had extensive knowledge in Victorian jewelry topics such as hair jewelry, pocket watches, watch fobs, slide bracelets, pearls, gold and cameos. Today, Motch houses those special types of Victorian estate jewelry. I thought Tim would make a perfect introduction for my radio show, “Opulent Annie’s,” and invited him to appear on the premier show on Saturday May 12, 2007. Coupled with his 30 years of experience, I also learned that Tim was an expert watchmaker and gemologist who has run his own pottery business for a while. He obtained his certification as estate appraiser - one of only 60 in the U.S. Many of the staff members of Motch Jewelers have years of experience, making it a dedicated and unique store. A Motch Jewelers offering, an exquisite Grey and Black Natural Tahitian pearls 11.4xx10mm. with a white gold catch. $13,500. 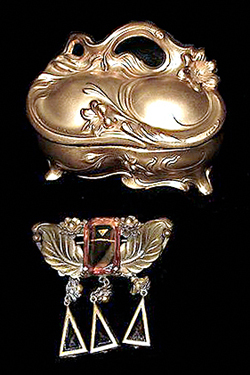 I entrusted Tim with several pieces of my Victorian family jewelry and found his craftsmanship to be meticulous; the repairs were exquisite, restoring the piece’s natural beauty and condition. It is well worth the investment, for any repairs or appraisals you may need, to receive Motch’s exceptional service and excellent value. Motch Jewelers is a full service jewelry store offering appraisal services, watch repairs, estate jewelry, jewelry repair and design, and jewelry consignment. They specialize in Rolex and Omega, as well as Luminex and Citizen watches. 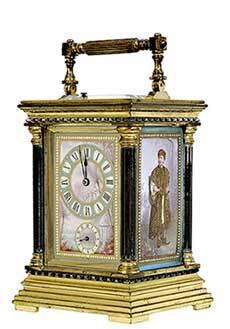 In addition, the store offers several clock lines such as Waterford crystal and other fine brands. 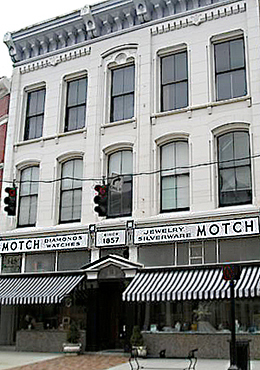 Motch Jewelers, situated in Covington’s newly restored wedding district, still stands, 150 years later, as a prominent structure and an eminent part of the city’s heritage, ready to be explored for your turn-of-the-century jewelry delights. The store is located at 613 Madison Avenue in Covington, Kentucky 41011. (859) 431-1745. About the author: Annie Kramer owns her own Victorian business called “Opulent Annie’s,” specializing in design and production of architectural ornament. She is a former radio host, as well as a Montessori teacher and freelance writer. She holds a Masters degree in Clinical Social Work from Bryn Mawr Graduate School, a Bachelors in Human Services and Counseling from Antioch University, an Associates in Early Childhood Education from Becker College, a post Masters in Montessori Education from Xavier University, and a certificate in family and marital therapy from University of Pennsylvania.